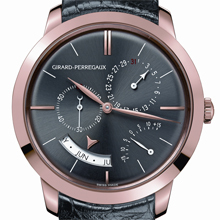 The Girard-Perregaux 1966 collection has been enriched by a new model with an assertive character. Combining the range's elegance and purity of line with the originality of a ruthenium dial, the Manufacture presents a new look for its Annual calendar and Equation of time model. 1966: Girard-Perregaux received the Neuchâtel Observatory's Centenary Prize in recognition of its developments in the field of research and precision. 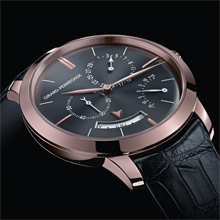 The Girard-Perregaux 1966 therefore pays homage to the brand's innovative spirit and illustrates its creative freedom, a combination of watchmaking excellence and style. Unsurprisingly, it has now established itself as one of the brand's emblems. This timepiece possesses all the assets of beautiful watchmaking, including its movement, the GP033M0. Composed of 287 parts, this calibre features remarkable finishes and was entirely developed and produced by the Girard-Perregaux Manufacture. The annual calendar presenting the date and month automatically takes the length of the month into account, requiring only the occasional correction every 28th February of non-leap years. With its hand at 4.30, the equation of time indicates the difference between the real solar time and the mean or civil time. The length of a solar day actually varies daily due to the elliptical shape of the Earth's orbit. This astronomical complication is based on an ingenious mechanism incorporating an annual disc with an elliptical cam that reproduces the Earth's movement around the Sun. The refined lines of this model reflect the craftsmanship of a sophisticated design. Created in the Manufacture workshops, its harmoniously curved case is 40 mm in diameter and its profile presents a remarkable silhouette. The entire ensemble has been meticulously crafted for perfect comfort and finished with care in order to reveal the precious nature of pink gold. 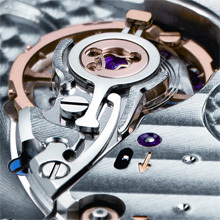 The open case-back reveals the movement and its oscillating weight. The timepiece presents delicate decorations crafted with respect for the strictest watchmaking traditions. The flat surfaces are circular-grained, sunray-brushed or decorated with Côtes de Genève, while sharp edges are chamfered then polished, as are the flat-head screws. The ruthenium-adorned dial was designed to offer an original, harmonious display. Delicately sunray-brushed, it is enhanced by baton-type applied hour markers and fine leaf-shaped hands that add to its clarity. The counters with their precise markings increase the readability of the functions. In a further touch of sophistication, Girard-Perregaux has equipped the calibre with its own Microvar variable inertia balance wheel. It features six adjustable screws and two inertia-blocks on its rim, used respectively to set the balance wheel's equilibrium and enable fine adjustment of the movement. This exclusive development ensures increased precision and more stable adjustment.